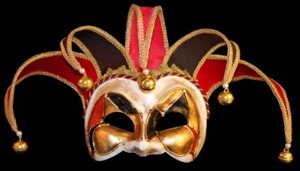 The Venetian Mask society presents a mask that is sure to perk up any party. The Joker Mezzo Velluto in an enchanting mix of black and red is a deluxe Venetian mask handcrafted by only the very best mask makers. This mask features dazzling jingle bells made of brass and Sculptable jester points that will awe other partygoers. The Joker Mezzo Velluto is also available in Blue. Order now and we will dispatch your mask immediately using only the most reliable shipping companies. Standard Ground Shipping and Next Day Air delivery option can be selected during check out. 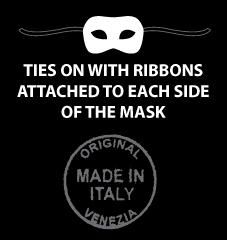 Create your own unique masquerade costume by adding a black, gold, or red hooded cloak made by Venetian Mask Society.